Trying to find a visa attorney in a foreign country can be a difficult task. There are a lot of people who want to take your money; it’s hard to know whom to trust. After meeting the nice people at U.S. Immigration Legal Advisors in their Bangkok office I found the staff to be very friendly and professional. 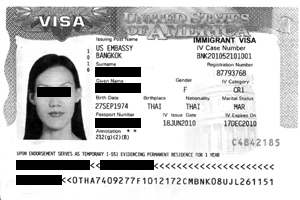 The visa process was explained to me and my fiancee and I felt comfortable knowing that when I returned to the United States they would take care of all the details for my fiancee in Thailand. U.S. Immigration Legal Advisors was successful in obtaining a fiancee Visa for my wife Phon and I would highly recommend them to anyone who needs help in the visa process.